As an actress, TV presenter and writer, Madhur Jaffrey has many strings to her bow, but it is for her cookery that she’s best known. Ironically, as a child she never went into the kitchen and when she left India, she could not even cook. 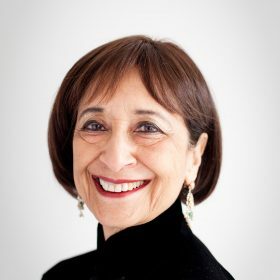 Born in Delhi, Madhur Jaffrey came to the UK at the age of 19 to pursue her passion for acting by studying drama at the Royal Academy of Dramatic Art in London. It was here that her love of cooking began, though more through necessity than anything else. While in London, she desperately missed Indian home-cooked food, so she started writing letters to her mother asking her how to cook different dishes. Effectively she learned to cook by correspondence. After graduating from RADA, she acted in TV, film and radio productions, but then left England and headed to New York where she became a food writer as a way of supplementing her income and to help get her children through school. Then came her hugely successful books and accompanying TV programmes. With four decades of culinary experience behind her, she unravels the mysteries of Indian food and says her aim is to keep things simple and easy to follow. As she only started to cook when she was 20, she writes from the perspective of someone who had to teach herself and is aware of all the difficulties presented in the kitchen.